Add Your Own Blog Post Here Now! I believe there is a business model that is so advanced and humane that it can sweep off with old conventional business .. Virtual Stock Market Game (ADS shares at all time low and will go.. Currently ADS share price is at 0.41 and that is around the historically lowest it ever was. At ADS management we've dec..
Today I've added another cool thing to our blogs system. I think everyone would like to feel more like they have their o..
Today we added a new bit of fun to Fish Hunt!! Today a comments reply system was added to our blogs system! Yay! It's now possible for existing clan leaders to update their clan profiles. You can add a clan logo, information about be..
LOWER FACE VALUE COINS HELP YOUR LAND RANK UP MUCH FASTER Don't underestimate the power of lower value coins such as..
Today we've added a feature to the website that allows players to set what bait they want to use. A feature we've wanted..
Players can now earn linden dollars by writing blog posts on our blog. 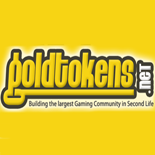 Anyone with a Goldtokens Account can start their ..
Landowners can place the new voting station on their land and use it to schedule automatic rushes. Scheduled rushes will..
New Gold Hunt Vote stations with gold rush scheduling ability hav.. If you want to be amongst 1st land owners to try gold rush event scheduling. To get Gold Hunt Vote station v1.6 IM: W..
From the shadows we've been working to improve Gold Hunt. We've been working hard to implement an automated event system.. Welcome to the age of Virtual Worlds is an article that explains a bit about the group of people behind gaming community..
1 whole night was pulled to optimize server side coin code. When players collect a coin now and successfuly pass the ant..